Use your skills to make our Saucy Mexican Chicken skillet! 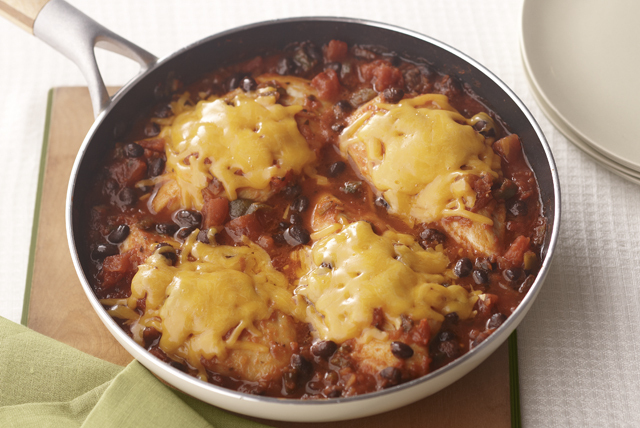 Salsa, black beans and cheddar cheese make this Mexican chicken recipe so delicious. Cook chicken in nonstick skillet on medium-high heat 4 min. on each side or until browned on both sides. Add salsa and beans. Bring to boil; cover. Simmer on medium-low heat 5 min. or until chicken is done (165ºF). Top with cheese. Remove from heat. Let stand, covered, 5 min. or until cheese is melted. Prepare using 8 boneless skinless chicken thighs. If you prefer to drain and rinse the beans, add 1/2 cup fat-free reduced-sodium chicken broth to browned chicken along with the salsa and rinsed drained beans.